This chicken dish is easy and so full of flavor. It was on my original list of recipes to make for 68 Days of Gourmet because it received great reviews and was originally published in 1974 (I’m trying to make something from every decade). I almost didn’t make it because I feel like I’ve done too many chicken dishes but I’m so glad that I did. We will most definitely be having this again. What is it about a delicious sauce that can really take a simple piece of sauteed chicken to a totally different level? I spooned this sauce all over my chicken and rice! Sorry for the lack of posts over the last few days. I’ve had the best intentions to update but have been so busy. 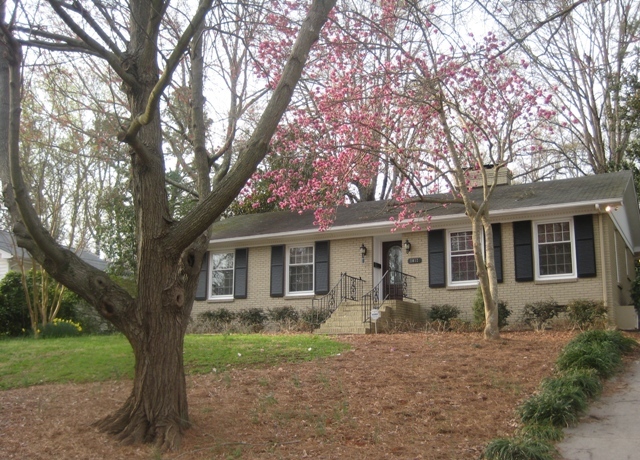 We are under contract on a house that we love and can’t wait to move into. We had been looking since November and getting really frustrated with the process and were so excited when this house popped up. We instantly fell in love. Please keep your fingers crossed that our closing goes smoothly! And we’ve been celebrating birthdays and visiting with our ridiculously cute nieces. 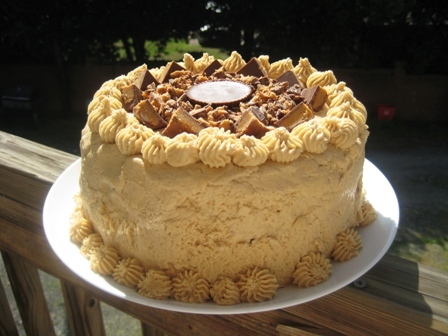 I have a sinful Reese’s Cake to share with you all after 68 Days of Gourmet wraps up! Rinse and pat chicken dry. Season with with 1 teaspoon salt and 1/2 teaspoon pepper. Heat oil and 1 tablespoon butter in a 10- to 12-inch heavy skillet over medium high heat. Brown chicken in 2 batches, turning once, about 8 to 10 minutes per batch. Transfer chicken to a small (13- by 9-inch) oven-safe roasting pan, arranging it in 1 layer. Once all chicken is browned, roast, uncovered, in oven 15 minutes. While the chicken is roasting, discard all but 2 tablespoons fat from skillet. Add garlic, shallots, carrot, thyme sprigs and bay leaves. Cook over medium heat, stirring and scraping up brown bits, until vegetables are browned, 3 to 6 minutes. Add tomato paste and cook, stirring, 1 minute. Add wine, vinegar, sugar and remaining teaspoon salt and 1/2 teaspoon pepper and boil, stirring occasionally, until reduced by half, 5 to 10 minutes. Add chicken broth to sauce along with any juices from roasting pan and bring to a boil. Pour through a fine-mesh sieve onto chicken in roasting pan, pressing on and then discarding solids. Continue to roast chicken, uncovered, until just cooked through, about 15 minutes more. Transfer chicken with tongs to an oven-proof serving dish and keep warm, uncovered, in turned-off oven. Meanwhile, boil sauce in roasting pan over high heat (I transferred it back into the original saute pan), stirring occasionally, until reduced to a scant cup. Remove sauce from heat and swirl in remaining 2 tablespoons butter. Season with salt and pepper and pour sauce over chicken. 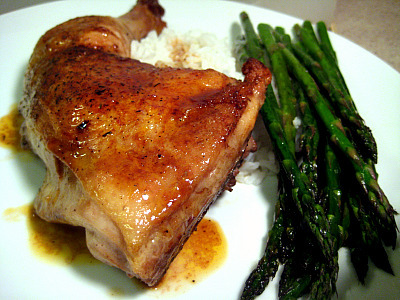 *Note, I easily halved this and just used two leg/thighs and only did one batch of browning.